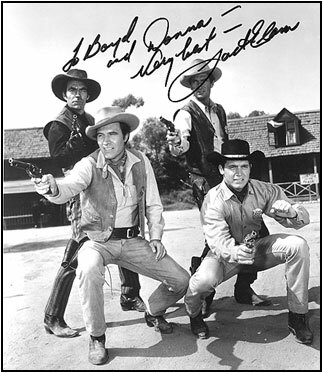 Do You Remember... "The Dakotas"
An exceedingly underrated series, “The Dakotas” was the most adult, hard-edged, high-energy, in-your-face, man’s western ever aired, crammed with tense, explosive action. Beginning with the stirring William Lava theme music, “The Dakotas” detailed the efforts of U. S. Marshal Frank Ragan and his three very diverse-in-personality deputies to maintain law and order in the Black Hills and badlands of Dakota Territory in the post Civil War era. The ‘62-‘63 season was the last for Clint Walker’s “Cheyenne”, which actually only lasted 13 episodes from September to December. The second half of that last season was completed by “The Dakotas” which, unfortunately, was cancelled at the end of its half season run. Produced by Warner Bros.’ William T. Orr, ABC aired the one hour b/w “Dakotas” in “Cheyenne”’s old time slot, Monday night from 7:30-8:30 ET from January 7, 1963, to May 13, 1963, a total of 19 episodes. Actually, a tryout pilot episode, “A Man Called Ragan”, had aired in the “Cheyenne” timeslot a year earlier on April 23, 1962. As totally-dedicated-to-the-law Marshal Frank Ragan, Larry Ward was constantly faced with the problem of bending the law to serve justice. 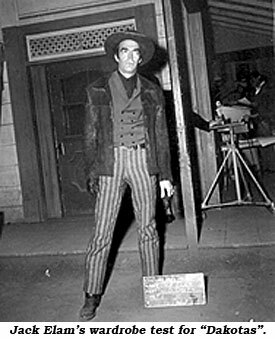 His chief deputy was former gunfighter J. D. Smith (perfectly cast Jack Elam), going as straight as he can given his troubled past (explained in “Return to Drydock” and “Reformation at Big Nose Butte”). Young and volatile, but loyal to Marshal Ragan, was Deputy Del Stark (Chad Everett). 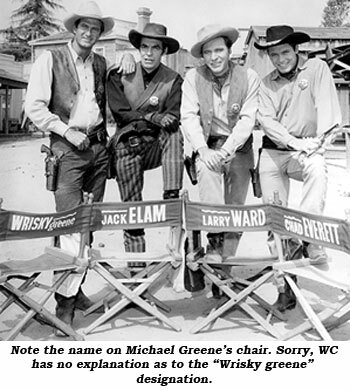 The fourth member of the crew was Michael Greene as gruff Deputy Vance Porter—usually given little to do. Cancelled after only 19 episodes, story editor Carl Stucke once related, “We had a battle with Metro who claimed we borrowed elements from ‘Bad Day at Black Rock’.” A ridiculous argument to be sure, but the dispute may have killed a splendid series before it really got a start. Or maybe the audience wasn’t ready for the brutally honest, unrelenting toughness of “The Dakotas”, as another version of the show’s demise has it that after “Sanctuary at Crystal Springs” aired on May 6, 1963, it caused a great deal of controversy. The episode involved Del and J. D. in an ultra-violent shootout gunning down the murderous Barton brothers inside a church. The adverse mail poured in. Unfortunately, what many viewers seemed to overlook was the exploration and debate later in the episode of the reasons, the rights and wrongs of the deputies’ actions. It made for one of the most compelling hour-long TV westerns ever aired. ABC, discouraged by the reaction, and also faced with low ratings opposite “To Tell the Truth” and “I’ve Got a Secret” on CBS and “Monday Night at the Movies” on NBC, acquiesced to the public’s indignation and elected to cancel “The Dakotas”. A true shame because every episode is a superlative well-written and well-produced one hour western.